Well how about that? I was just going write a post wondering why the announcement of ArcGIS 9.1 SP1 wasn’t on the front page of ESRI Support but to my surprise ESRI reorganized the front page and the service pack is front and center. 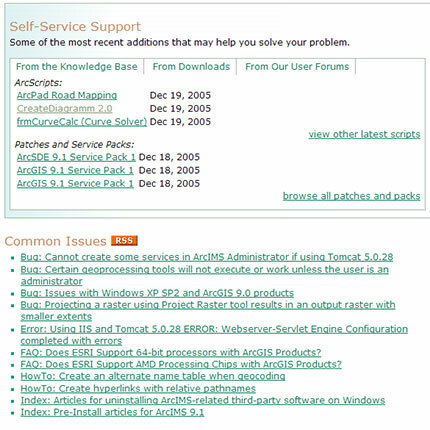 Not only do you get the latest knowledge base, downloads and forums right on the front page, but right below you’ll see an RSS feed for “Common Issues”. We’ll have to see how this feed works and what ends up on it, but now finding the latest support information should be as easy as looking at the front page. Great news! The only issue I see is the page looks better in Internet Explorer than Firefox, but that is merely cosmetic.